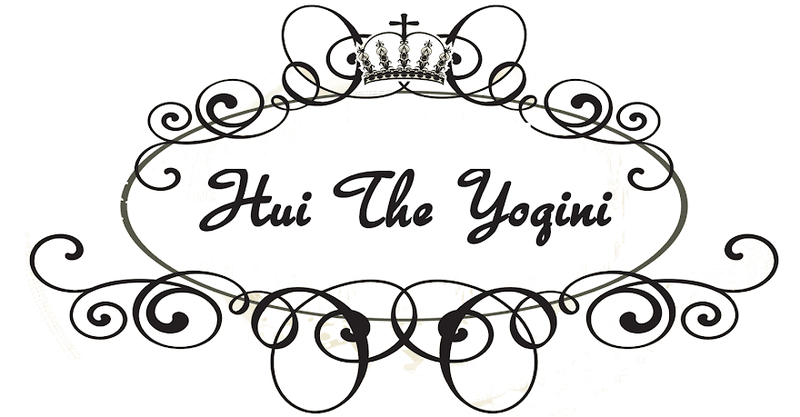 Hui the Yogini: Are you getting yours? Here's some food for thought. 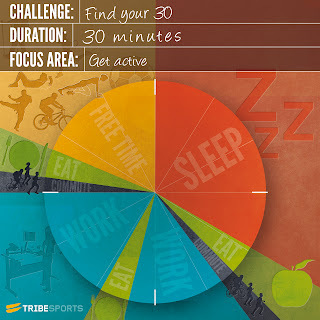 Tribesports recently ran a challenge, to do 30 minutes of exercise every day for a year! 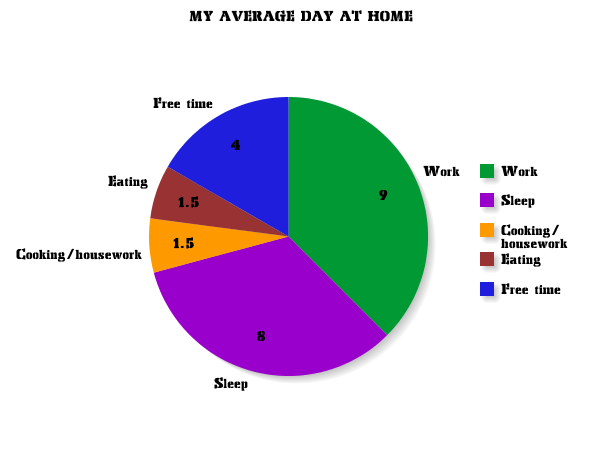 To help convince you that you do, in fact, have 30 minutes every day to spare, they've even included this nifty pie chart. Hmm... that looks like an unconvincingly exaggerated amount of free time...you might be thinking. Or maybe that was what I was thinking... so I decided to create my own pie chart to compare. Numbers represent amount of time in hours. Work includes commute time. Sure, my pie chart isn't as fancy as theirs, but I was still utterly stunned by how exact the size of the Free time slice is in similarity. I'm also stunned (and slightly embarrassed) at how much free time I have. 4 hours a day! When I further reflect upon how I spend that free time, I am slightly horrified. For the rest of us, why is it so hard to find 30 minutes every day to exercise when you have an abundance of free time? I think the answer is pretty simple. Priorities. 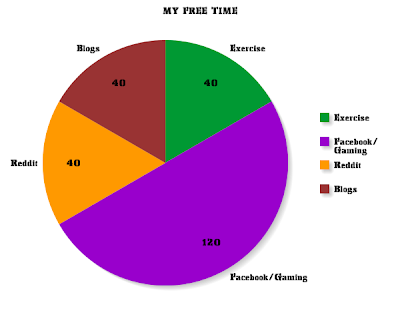 My Free Time chart says it all... I would rather spend more time dawdling on Facebook than any other brain or body-building activity. I couldn't even tell you what I do on Facebook every day. I believe I just stare at my news feed waiting for it to self-update. I solve this problem of life-stalling by exercising first thing in the morning. Before my brain activates its excuse-giving centre. It could mean that you might have to wake up earlier. I did, and have been ever since I started this blog. I also have a yardstick to decide if I do have enough time to exercise. I ask myself... do I have time to game/reddit/facebook? And the answer, almost all of the time is... yes. In fact, I am probably gaming/redditing/facebooking when I ask myself that question. If you have time to do all of that, you have time to exercise. Believe it or not... I use that yardstick in almost any situation... including if I should call in sick at work. Am I too sick to play Diablo? No... ok, off to work I go. Still unmotivated? That's partly the reason. You're unmotivated because you'd rather be doing something else (which brings us back to Priorities. See the nasty neverending circle?). What you need is a fitness-oriented community. Tribesports is a pretty good start, in fact it will suit most Facebook junkies because it functions on a similar platform. You know how they say it's harder to quit smoking when all your friends are smokers? It's harder to get fit when all your friends are making excuses with you (or worse, for you). I also have my regular Facebook news feed bombarded with motivational posts by Lorna Jane. Looking at their super fit models wearing super hot exercise gear gets me off my bum every time. Find your niche sport. If you can't bear the thought of going for a run, try something else. There are so many sports out there... I've tried horse riding, swimming, wind surfing, snowboarding, yoga, pilates, zumba, and I was a school athlete. Nothing clicked with me as much as yoga did. I just kept wanting to go back, and learn more, and do more. I looked up bigger challenges on my own outside classes... you know you've met your sport when you want to do it every day, no carrots dangled. Tell the world about your new fitness goals. It helps you keep them. I recently blogged about my new Spring Fitness program, and you may have noticed a new This Week's Workout panel on the right. Having a fitness program planned publicly made me more motivated to keep to it, and I did. You may have noticed that I haven't got anything scheduled on Saturdays or Sundays... I'm normally travelling between homes on weekends, I know it sounds like an excuse, but I try to squeeze in exercise when I can, it just happens in addition to my planned exercise. Happy challenge-ing people! I'm keeping my fingers crossed that I will keep to my fitness regime up all year long. Thanks Adrian. I could really do with some disconnect time and self-discipline.